We recently added a HomePod to our iOS-connected home - replacing a SONOS Play:1. As a music player, it's an improvement. But that's really only the tip of the iceberg. Adding a HomePod brings HomeKit into the mainstream. It's a major leap forward. HomeKit has been moving forward at an excruciatingly slow pace, for several years. It's become apparent that Apple has strong beliefs about how a connected "smart" home should function, and they aren't willing to waver on those core principles in order to gain more immediate third-party support. In practical terms, this has made us slow adopters. There is a meaningful chance we'll be selling our house in the spring, and I'm reticent to put too much time and energy into smarthome technology, given that we anticipate leaving much of it behind. HomePod has me excited about HomeKit for the first time in forever. It's a major leap forward for the entire HomeKit experience. And a HomePod, of course, moves with us. 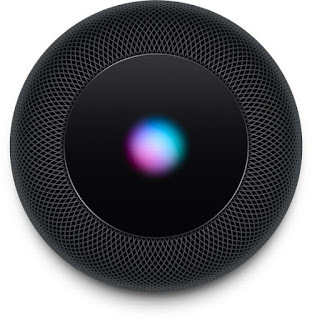 Prior to the HomePod, HomeKit (and by extension, Siri) lived on our devices. Yes, it worked. I could lift my iPhone, say "Hey Siri, turn on the Christmas lights", and they'd turn on. But by the time I'd gotten my phone out, and worked my way through the Siri prompt, I could have just opened the Home app and clicked the lights on. When HomeKit was device-based, Siri voice control was unnecessary. A neat parlor trick, but not transformative. With a HomePod, Siri lives everywhere in your home. Voice control is no longer a silly proof of concept - it's now the quickest and easiest way to control your HomeKit devices. We may be sitting at the dinner table, and hear some traffic on the street which seems louder than normal. Last week, someone would say "Is the garage door open? ", and then we could check. Now, we can say "Hey Siri, is the garage door open?" ...and immediately get the answer. The absolute best thing about SONOS was the ability to play the same song in multiple rooms, each with the correct relative volume, and perfectly synced. The realization that "the same song is playing out here too!" as you walk from the living room outside onto the patio during a big party, is absolutely worth the price of admission. It's a "wow" moment. With AirPlay 2, that kind of multi-room music control becomes core functionality. And even better, with HomePod, it becomes voice controlled. We have an AppleTV in three rooms - as cord-cutters, it's our only set-top box. With AirPlay 2 and a HomePod, our AppleTV-based home theater system becomes another node in our multi-room audio system. It is EXACTLY the same experience as adding a SONOS Connect... but with no additional expense, and no need to change stereo inputs. The AppleTV 4K has already replaced our DirecTV Genie DVR, our 4K Blu-Ray player, and our video game system. Now, it replaces our SONOS Connect, too. HomeKit is definitely an expensive proposition. We got ours a few weeks ago when Best Buy was running a $50 off sale, and we had some expiring BBY coupons, and even then, we were in for almost $300. Even so, my first impression is "we need more HomePods". While the microphone is strong enough to hear commands from basically anywhere on the main floor, I'd like to get voice control upstairs. I'd like to turn our current HomePod into a stereo pair. I'd like to have more AirPlay 2 nodes with HomePod speaker quality. In the short term, though - the HomePod brings enough to the Apple Music / multi-room audio space to make it a worthwhile addition. More importantly, it frees Siri from the confines of your iPhone, and changes HomeKit from "niche, geeky remote control for house things" into "all-encompassing smarthome AI". I can't wait to see what else we can do with this thing.